This could be a great commuting machine — it’s an electric-powered bike designed by the French company Matra. The bike was recently introduced at the Paris Motorshow. 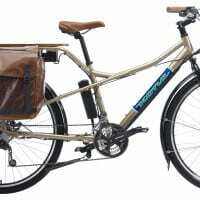 It has a range of 60 miles, in addition to the mileage you add by using pedal power. It has a top speed of 30 miles per hour, but this is an artificial limit set on the motor. It can be rigged to go faster, but officially, you’d have to get a license to drive it, because it would be considered a moped. The bike also incorporates disc brakes and a regenerative braking system — nice. This bike should be available for sale in Europe in the not-too-distant future, but no word on whether it’ll make it to the States. It will probably be priced around $5000. Hey! It’s soon 2012. Where can we get the ms1??? Any website? Would like take it in to Norway….. Pretty nice bike but it’s much cheaper to build your own. Quite pricey but I love it and hope it comes to the States. Now 75, it better come soon!